Are you a grace person or a truth person? Have you ever even thought about it before? You may be wondering what that even means. Let me explain. This is a question that was asked during a Bible study that we’re going through at my church. You see, people tend to be one or the other, or at least lean more towards one or the other. So what is a truth person or a grace person? A truth person tends to see the world as black and white. There is right and wrong; dark and light , good and evil. There are rules and there are those who keep them and those who break them. Truth people want to keep the rules and they want others to keep the rules too. That is what’s right after all. A grace person tends to see the world more in shades of gray. It’s not that they don’t believe there’s a right and a wrong, it’s just that the lines between the two may not always be clear. A grace person doesn’t want to break the rules but if one gets bent every once in a while it’s okay. We are all human after all and nobody’s perfect, right? 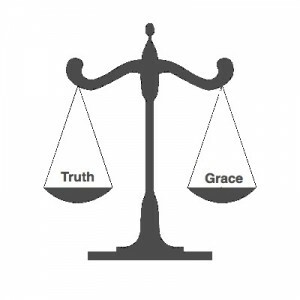 So which are you, a grace person or a truth person? I do it’s clearly spelled out in our own conscience. We know when we’ve done wrong. Therefore, we should do right, right? Did you see that, both grace and truth existing together in the person of Jesus Christ? He is both. He’s not part grace and part truth. He is full of grace and truth. Jesus never once compromised truth. He never once broke any of God’s commandments, or told anyone else to ,or told anyone it was okay if and when they did. At the same time He was always ready to forgive, always ready to show love and patience to those who needed it most. He told the woman caught in adultery, “Neither do I condemn you; go, and from now on sin no more.” There it is, the fullness of grace and truth in Jesus Christ. Go through Scripture and look at the life and words of Jesus and you will see it over and over again. We even see both in the cross. There Jesus is, meeting all the requirements of truth, paying the penalty for sin and yet He never broke one commandment. Grace and truth. I’m a truth person. And yet I am continually overcome by grace. There’s nothing wrong with the truth, it’s a good thing, but without grace truth will always bring defeat. Grace brings victory and salvation. It’s not one or the other, it’s the fullness of both in Jesus. My desire and prayer is that both would be seen in my life and heard in my words; that I could/would be more like Jesus. I love what Max Lucado has to say about the cross. Why is the cross the symbol of our faith?To find the answer look no farther than the cross itself. Its design couldn’t be simpler. One beam horizontal—the other vertical. One reaches out—like God’s love. The other reaches up—as does God’s holiness. One represents the width of his love; the other reflects the height of his holiness. The cross is the intersection. The cross is where God forgave his children without lowering his standards.